Based on the popular and provocative book, Seeing Through Maps, this new DVD provides a fascinating 30-minute exploration into the minds of twelve mapmakers and how their unique backgrounds, philosophies, values, and politics led each to select a particular mathematical formula to create their maps. Learn about the impact those world images have had on us, consciously and unconsciously. An invaluable resource for classes dealing with issues of cultural bias and ethnocentrism. Includes over 70 Powerpoint images and more. Ruth Abrams from Brookline, MA retired from her job as Director of Amenities at New England Baptist Hospital in 1994. At 70 years old with a undergraduate degree in photography she decided to go back to school to study videography. Since that time she has won seven awards for her video work including the 1998 Massachusetts Cable Television Division; 2000 Hometown USA National Festival; and the 2003 Alliance for Community Media. Her collage and assemblage work has also been shown at many venues around Boston including Newbury College Gallery and the Boston Museum of Science. In the 1970's Bob Abramms founded ODT, Inc. which offered consulting and training to companies wishing to develop and honor diversity in the workforce. Among the many mind-expanding tools that Bob used in presentations and workshops were a variety of maps, finding that they were excellent devices for showing different perspectives. 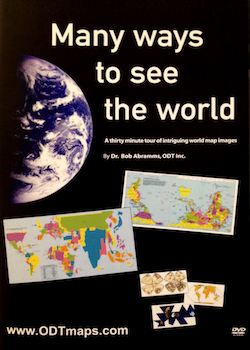 Eventually, ODT began selling those alternative maps, and today most of the company's business is in the publishing and distribution of products that offer "different ways to see the world." Bob served as projector director for the startling and beautiful "Population Map". "Many Ways to See the World is more than a fascinating lesson about maps. It opens the mind of the viewer to profound perspectives on the interconnectedness of human beings everywhere. I hope it will be shown in classrooms all over the country." "An intriguing new video with a big message... A fascinating exploration of world maps and their ability to convey powerful and lasting images... Trainers can find many uses [including] sessions on critical and analytical thinking; cross-cultural training; negotiating differences; and more. Viewers will find it motivational, entertaining, and educational." "This video is a delightful and wondrous resource to discover new ways to see the world."